ARABIC: Yasamen katheb, Yasamen zefar, Shajar khat. CHINESE: Ku lang shu, San fu mun. HINDI: Chhoti-ari, Sankuppi, Sangan-kuppi, Vilayati mehendi, Batraj. MALAYSIA: Bunga pawang, Gambir laut. Clerodendrum is a genus of flowering plants in the Lamiaceae family. 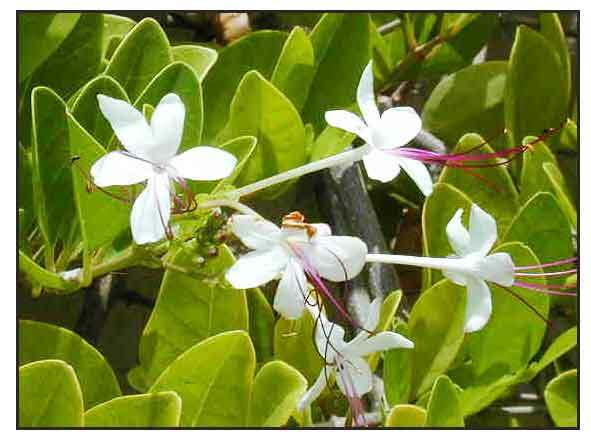 It is a member of the subfamily Ajugoideae, one of four subfamilies transferred from Verbenaceae to Lamiaceae based on morphological and molecular phylogenetics. Clerodendrum L. is widely distributed in the tropical and subtropical regions of the world, with more the 500 species identified, with ethnomedical use in many indigenous systems (Indian, Korean, Japanese, Thai, Chinese) for a variety of disease: syphilis, typhoid, cancer, jaundice and hypertension. 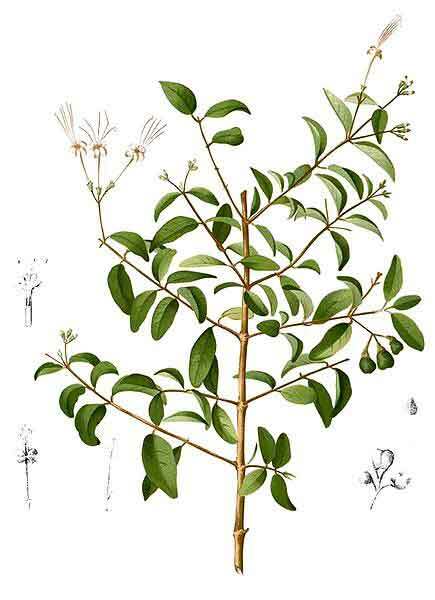 Mañgoñgot is an erect or somewhat struggling shrub 1 to 4 meters high. Leaves are ovate, oblong-ovate or elliptic ovate, 4 to 8 centimeters long, 2 to 5 centimeters wide, shining, smooth, entire and pointed at the tip. Inflorescence (cyme) is usually composed of three flowers, borne in the axils of the leaves. Calyx is green, narrowly funnel-shaped, and furnished with 5 very short teeth. Corolla is about 3 centimeters long and comprises a slender, white tube spreading, purple-tinged lobes about 7 millimeters long. Stamens are long-exserted, and purple. Fruit is obovoid, about 1.5 centimeters long, and splitting into 4 pyrenes. Calyx in the fruit is about 1 centimeter in diameter. - Along the seashore and beside tidal streams throughout the Philippines. - Occasional cultivation as hedge plant or ornamental. - Widely distributed throughout India, South and Southeast Asia, Australia, and the Pacific Islands. - Phytochemical studies reveal the presence of flavanoids, sterols, flavones, triterpenes, diterpenes, quinone and neolignans. - Leaves yield a bitter principle that is entirely removed by ether; and treatment with alcohol and water yields extracts free from bitterness. The bitter principle shows a resemblance to Chiretta (Swertia chirata), a gentianaceous plant. - Leaves also yield a fragrant stearoptin with an apple-like odor; resin; gum; brown coloring matter; and ash containing a large amount of sodium chloride (24.01% of the ash). - Study of hexane extract of the aerial parts isolated an aliphatic glucoside characterized as pentadecanoic acid-ß-D-glucoside. A butanol extract yielded acacetin and apigenin. - Aerial parts yielded a new clerodane diterpenoid, cleroindermin, and a known flavonoid, apigenin. - Leaves are mucilaginous, fragrant, resolvent. - Considered alterative, analgesic, antimalarial, febrifuge, hepatoprotective, antifungal, resolvent. - Roots considered febrifuge and alterative. - Studies have shown antibacterial, antifungal, mosquito larvicidal, hepatoprotective, hypotensive, analgesic, anti-inflammatory, anti-carcinogenesis, cytotoxic, anti-diabetic, antioxidant, antipyretic, insecticidal properties. - In the Philippines, root decoction is used as febrifuge and alterative. - Leaves are used in poultices as resolvent. - Elsewhere, the root, boiled in oil, is applied like a liniment for rheumatism. - In Guam, the bitter root, leaves and wood are used by natives as a remedy for intermittent fevers. - Poultices of leaves used for swellings to prevent suppuration. - Leaves and roots, in tincture and decoction, used as substitute for quinine. - Juice of leaves and root used as alterative in scrofulous and venereal diseases. - Used for elephantiasis, asthma, topical burns. - Poultices of leaves applied to resolve buboes. - Leaf baths recommended for mania and for itches. - At one time, sailors of Macassar were reported to take the fruit, seeds and roots to sea, and a decoction or pounded seeds were ingested when taken sick by ingestion of poisonous fish and crabs. - Leaves, eaten with rice, used to increase the appetite. - In Java, fruit used as medicine for dysentery. - In Africa, used to treat hypertension. - In traditional Indian medicine, leaves used for treating fever, cough, skin rashes, boils; also, for treating umbilical cord infection and cleaning the uterus. - In Ayurveda, plant used as sources of Patha, used in the treatment of urinary and heart related disorders. - In India, powdered leaves mixed with camphor, garlic, or pepper and used for edema, muscular and rheumatic pains. Roots used for venereal diseases. Clerodendron Inerme Protects Cellular Integrity during 7,12-Dimethylbenz[A]-Anthracene Induced Hamster Buccal Pouch Carcinogenesis / Shanmugam Manoharan, Kannan Kavitha et al / Afr J Tradit Complement Altern Med. 2008; 5(2): 213–222.